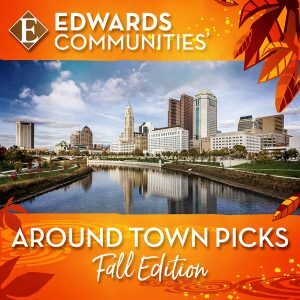 Columbus offers a unique mix of fall activities in October, combined with Buckeye football fever and festive events that put you in the spirit of the season. So whether you live in Columbus, are hosting a business event in the area, or are here visiting relatives, we invite you to sample all that our city has to offer! Enjoy the most delicious Mac & Cheese dishes from the best Columbus restaurants. The Columbus Mac & Cheese Festival benefits the adolescent and young adult cancer program at The Ohio State University Comprehensive Cancer Center. Nothing says Fall in Columbus like Ohio State Football! The Buckeye’s season is in full swing this month, with two home games taking place on October 6 against Indiana and October 13 against Minnesota. Even if you can’t snag tickets, there are plenty of places to tailgate in Columbus and cheer our Buckeyes to a win, including Edwards’ private club, The Barn! Go Bucks! The Columbus marathon and half marathon is the 17thlargest US marathon and largest in Ohio. The half marathon is the largest in Columbus. Runner’s World ranked it as one of the top 20 marathons in the US, and USA today ranked it as one of the top 10 fall marathons. Click here to register. Celebrate costumes and creativity with the nation’s most elaborate costume party! This Halloween tradition bridges runway style with the culture of the Short North Arts District. Visit their website for more information and to purchase tickets. A Haunted Night in the Gardens, October 27, Hoover Gardens and Gift Center Association. Enjoy a spooktacular event that has something for the whole family! Walk through a haunted maze, play games, win prizes, paint pumpkins and enjoy hot popcorn and apple cider. Learn more here. The Columbus Crew, Ohio’s Major League soccer club will be hosting a home match against Minnesota United FC at MAPFRE Stadium on October 28. Check out their website for details and to purchase tickets. These are just a few of the fun events offered in October in our exciting city! You can learn about other events by visiting local websites such as Experience Columbus and Columbus Underground).